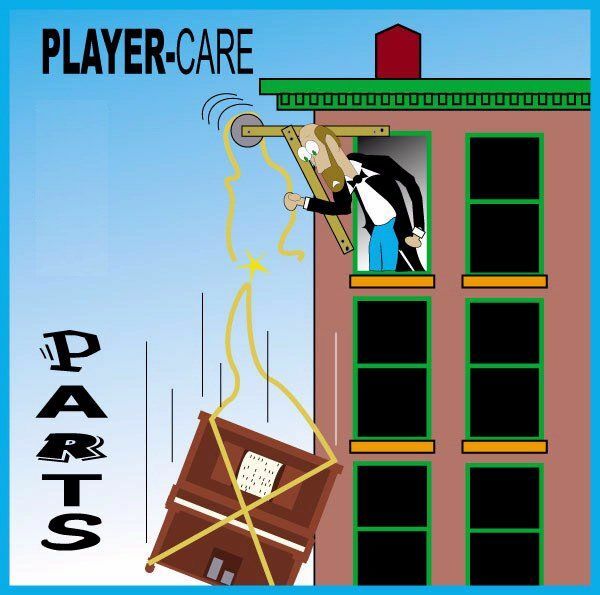 Below is a relatively short video showing the steps required to move the upper deck of a Kimball Model A Electromatic player out of the way so the piano can be tuned. This piano was made in 1964 and works surprisingly well for its age. There are a few things that aren't readily apparent in the video. First, the tubing on the right end is not long enough to allow the deck to be placed on the pin block. As stated in the Instructions for the Tuner, the tubing is suppose to be long enough that the whole deck assembly can be raised 12" from its resting place. However, that simply wasn't possible in this case. Secondly, I did end up removing the honky-tonk attachment from the honky-tonk bellows. Even at that, there was only about 4" of space between the deck and the tuning pins. Also, due to the location of the deck, it was necessary to 'lean over' the deck to tune the piano, which slowed the job down significantly. 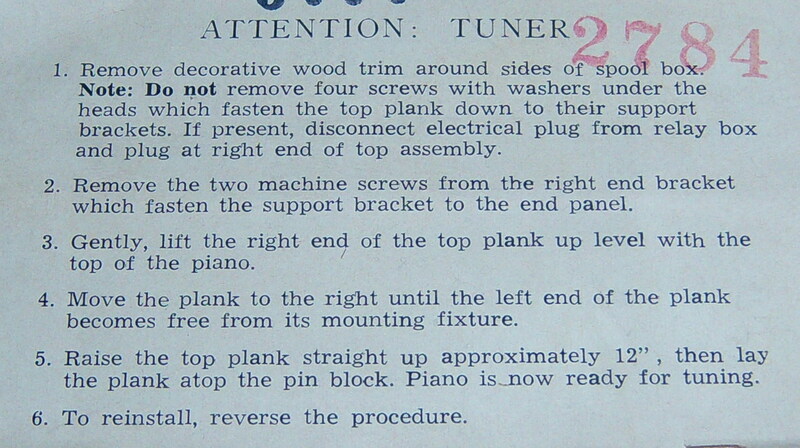 Thirdly, although the instructions specifically state that the four screws with the washers should not be removed from the mounting bracket, this particular deck could not be moved without first disconnecting the brackets from the deck (or 'top plank'). The main reason it was necessary to remove the brackets was that the tubing simply wasn't long enough on the right to allow the whole assembly to move far enough to the right to clear the bracket bolts on the left. With the brackets released from the deck, the bracket could be tilted so that it cleared the two mounting bolts on the right, which allowed the bracket to be removed from the piano. To my surprise, all of the electrical functions, i.e., Play, Rewind, and Auto-Shut Off, in this unit worked well. There was a little problem with the roll sensing switch (auto-shut off after reroll) which was resolved by putting a tiny amount of Marvel Mystery Oil on the linkage, which had become a bit corroded. Also, the delay function, which stops the roll at the end of the play cycle and switches the electricity to the rewind motor a few seconds after the roll stops, worked flawlessly. 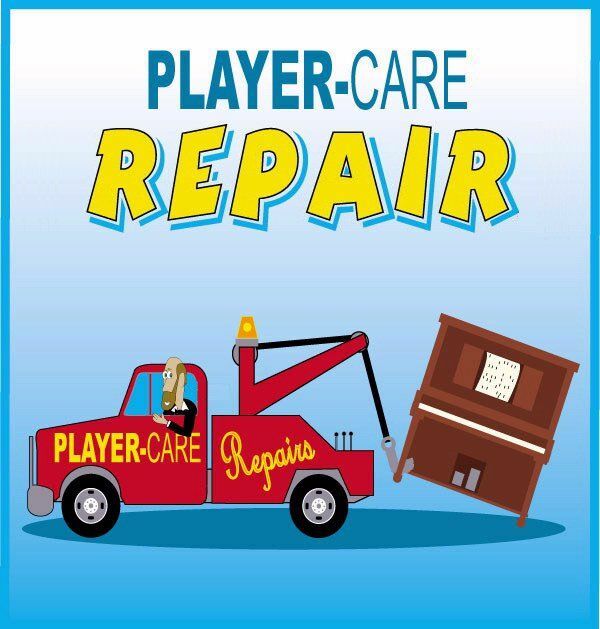 The only real problem which the player system, as I have also experienced with two other Model A Kimball players in the past year, was that the small note bellows are getting stiff with age (or non-use). As a result, the unit hardly played at all on the Low Volume setting. (There are only two volume settings on this unit, i.e., High and Low.) So, in this case, I made a modification to the volume control by limiting how far the volume control bellow could open when the Low volume setting was selected.